Opossums are often thought of as dirty creatures whose most impressive trick is acting like roadkill. But the truth is that opossums are smarter, cleaner, and more beneficial to humans than many of their woodland neighbors. The possum looks like a cute cross between a squirrel and a chinchilla. It’s our only member of the ancient group of animals called the marsupials. Virginia opossums are about the size of housecats, and are mostly grey, with a white face. They have a pointed nose, short legs, and a long rat-like tail. These animals walk in a curiously slow, hobbling manner. However, they are good climbers. They often use their flexible tails for balance, or to hold nesting material when climbing, and young use their tails to cling to their mothers’ backs. Virginia opossums are mostly active at night. Their eyes are well-adapted to darkness. During the day, they den up in hollow trees, brush piles, or spaces under structures built by people. Virginia opossums are omnivores. This means that they will eat a variety of foods, including meat and plants. They will also eat amphibians, reptiles, earthworms, birds, and small mammals, as well as seeds and fruit. It’s illegal to keep them without a wildlife rehabilitation permit, and once they’re old enough to survive on their own, healthy possums should be released. They are wild animals who don’t fare well often in captivity. People have been keeping ‘possums as pets for centuries. They have also been raised for meat, according to the New York Times, once even served at the White House. 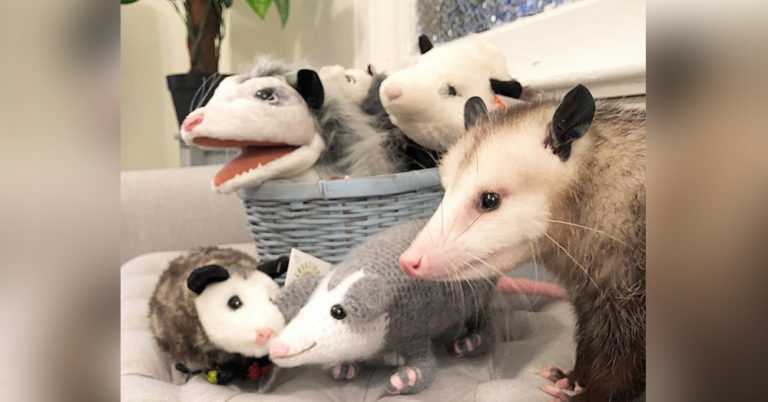 Today, the opossum kingdom has a number of human supporters. Many of them own possums eagerly. The most familiar opossum pet is named Starfish. She hails from Virginia, where she is kept by certified wildlife rehabilitator Ally Burguieres.